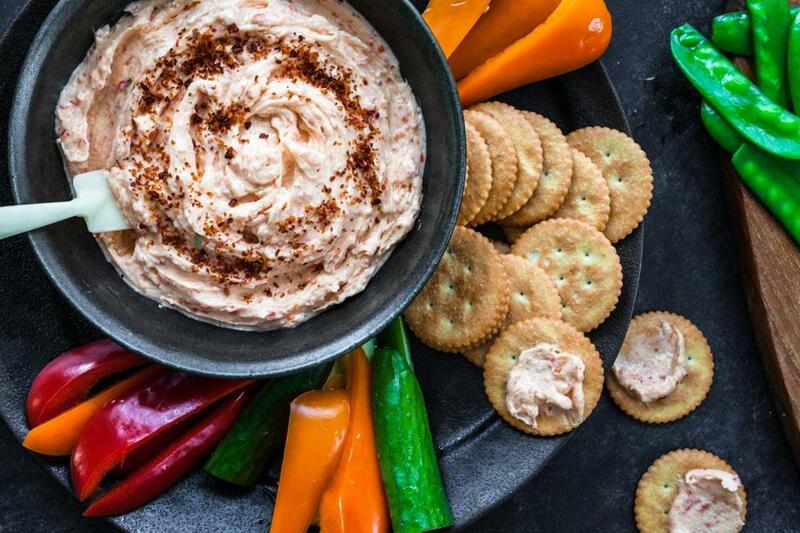 Similar to pimiento dip (often called the caviar of the South), this peppadew dip should be called “I-can’t-stop-eating-this.” On Super Bowl Sunday, just give in. If it makes you feel better, surround the bowl with vegetables. Peppadews are mild, sweet, grape-size red peppers pickled in brine, a South African specialty, on shelves in jars or by the pound at specialty markets. They are mixed with sharp cheddar, cream cheese, mayonnaise, and cayenne pepper to make a creamy, lightly spicy dip. 1. In a food processor, work the cheddar, cream cheese, and mayonnaise for 1 to 2 minutes, or until smooth and creamy. 2. Add the peppadew peppers, brine, cayenne, and salt. Continue pulsing until smooth. Taste for seasoning and add more cayenne and salt, if you like.